Probability PLC, a mobile gambling company has reported losses exceeding £750,000 in the time betwixt April and September 2010. The company has reported a decline in net mobile gambling revenues from £2.48 million a year ago to £2.31 million, a loss of 7%. As bad as this loss may sound, it is actually a result of strategic technology investments and operational restructuring. Since launching the “Touch” casino last July, both iPhone casino users and Android casino users have actually increased and now they collectively account for 22.5% of player deposits, almost twice as much as they did a year earlier. Last month, the deposits were 64.5% higher than the previous April. Next March, the mobile gaming company will be swapping from Alderney license to a Gibraltar license. Both moving to Gibraltar, in October, and the termination the Alderney gaming license, at the beginning of the next financial year, are expected to reduce fixed costs. Last May Probability has established a new business-to-business partnership with Paddy Power. Probability will be supplying content to the Irish gambling firm. Moreover, in November, Probability raised money for expansion. This is all part of a larger trend. 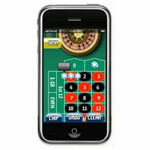 With the incredible popularity of Apple devices, online gambling groups see iPhone profits skyrocketing. H2 Gambling Capital suggests that mobile phone gamblers are providing significant profits, even accounting for 15% of all business among many European companies. Mobile casino games appeal to players because they are quick and portable, allowing gamblers to play on the go without committing large periods of time. Those who enjoy wagering on the stock market may be interest to know that the share price of Probability rose 1p to 60.5p at midday today.